Cloud Networks are user-defined Layer 2 networks that are fully isolated and single-tenant, and offer users a way to securely connect their application servers. Cloud Networks can be provisioned as either IPv4 or IPv6. Unlike PublicNet and ServiceNet, it is possible to assign specific Cloud Networks IPs to Cloud Servers, either at build time (by creating a port with a fixed IP) or to an existing server (by creating a port with a fixed IP and the existing server's UUID as device ID). Cloud Networks is recommended for all inter-server communication. Even though ServiceNet can also be used for server east-west (backend) connectivity, we do not recommend ServiceNet for that purpose because, unlike Cloud Networks, ServiceNet is multi-tenant. To prevent spoofing, ServiceNet is filtered on the source and destination MAC, and destination IP. Thus, NAT will not work via ServiceNet. If you want to NAT, create a Gateway Instance and use Cloud Networks. Up to 10 cloud networks are supported per region, with 250 hosts per network. Cloud Networks can be attached to and detached from live servers, making it possible to change the network while rebuilding Cloud Servers. Cloud Networks also includes full support for broadcasting and multicasting required for some clustering technologies. Aggregate outbound bandwidth limits across all attached network interfaces (PublicNet, ServiceNet, and Cloud Networks) are defined for each Cloud Server based on its performance characteristics. By choosing a flavor class and then a specific flavor within that class, you can configure your Cloud Server's network speed within the range available to it. In the Cloud Control Panel, use the slider to change network speed and other characteristics. 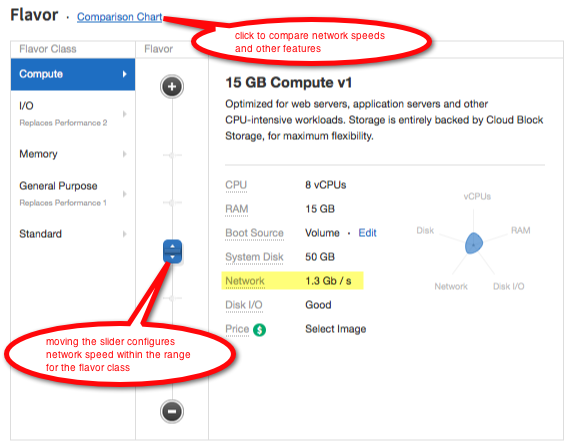 For virtual Cloud Servers, the "Comparison Chart" link provides a detailed comparison of the configuration available for each flavor. You can read more about how choosing a flavor class influences your cloud server's configuration at Understanding flavor classes. As with physical servers, networked Cloud Servers are subject to relevant limitations and requirements. Throughput is called "Network" in the mycloud portal. Throughput values listed in mycloud are theoretical maximums. There is no SLA for throughput. QoS is set across 2 sides of a bond, which means that any single layer 4 connection will get at most 1/2 of the maximum throughput advertised in the portal. There are 2 QoS buckets - one for PublicNet and one for ServiceNet/Cloud Networks. PublicNet throughput is exactly one-half of ServiceNet/Cloud Networks throughput. Host networking on Cloud Servers is redundant, with bandwidth delivered over two separate bonded interfaces, each able to carry 50 percent of the aggregate limit. Rackspace recommends using multiple Layer 4 connections to maximize throughput. You can attach networks to or detach networks from a Cloud Server through the Rackspace Cloud Control Panel or an API. Attaching any single network to or detaching it from a live server results in a full reset of networking on the server. This reset causes a brief disruption in network connectivity on all network interfaces on the server and should be used with caution. For OnMetal servers, attaching and detaching networks is not supported. Managed Operations customers may not detach ServiceNet. Detaching PublicNet and ServiceNet results in a permanent loss of the IPs attached to those networks. You can add values such as gateway IP, DNS server IPs, and static routes into your Cloud Networks subnet and have them automatically injected to your Cloud Servers at build time, or when they are attached. For more details, see "How to set up Internet access for servers without PublicNet or ServiceNet" on the Building servers without PublicNet or ServiceNet page. Rackspace offers the ability to add IPv4 addresses to Cloud Servers for a fee. Because of the global shortage of IPv4 address space, you might be asked to justify your request for additional public IPv4 addresses. Rather than assign multiple IPv4 addresses on a single Cloud Server, we highly recommend using Cloud Load Balancers. Multiple Cloud Load Balancers can have the same Cloud Server in their pools. If you still want to obtain an additional IPv4 address for your server, open a ticket through the Support section of the Rackspace Cloud Control Panel to get policy details and request approval. In some circumstances, we might ask you to provide an SSL certificate. We cannot allocate more than four additional IPv4 addresses to a single server. This limit gives each server a maximum capacity of five IPv4 addresses, including the originally assigned public IP address. Cloud Networks Can be IPv4 or IPv6. For v4, choose a range between /28 and /24. Gateway IP and DNS Servers not defined by default. Must be defined for Gateway Instances to work properly.